Or something like that. It's not me exclusively working on it though, i have my dutch friend Chartle (his nickname) doing programming along with myself. Once you've shot bad guys and gone through the first level, you find yourself in a shop. 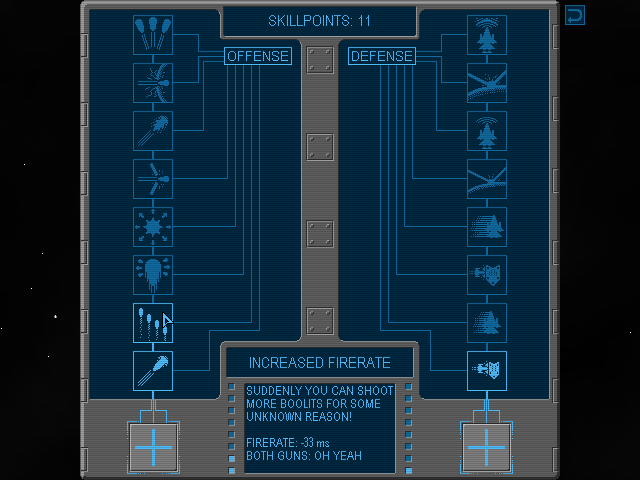 THE SKILL TREE. These upgrades are tailored towards attack or defense, and are not mutually exclusive. However, once we get some more levels done, the rate of skillpoint acquisition will be slowed, so the player will end up with approximately 10 skillpoints by the end of the game. 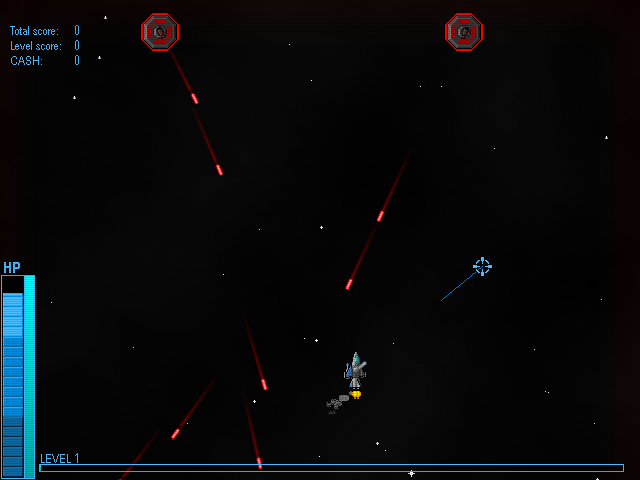 - You have two weapon systems, accessed by left (turret) and right-clicking (double front). 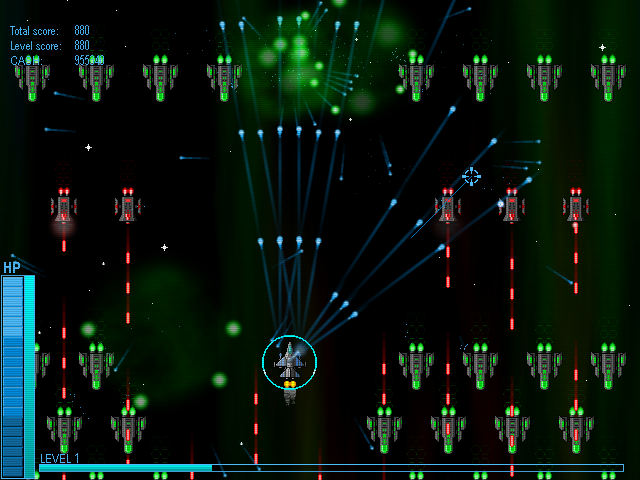 - You can fire massive super shots by pressing E (turret) or F (double front). They expend energy, which is the blue bar next to your health. 55% for E, 90% for F. Energy recharges. - You can move in all four directions. 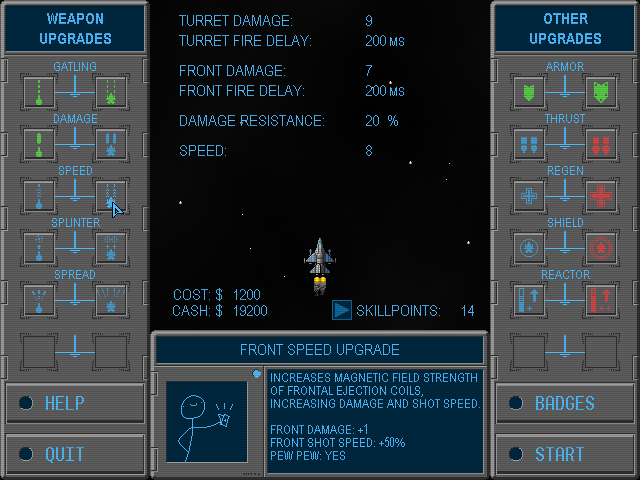 - With the appropriate upgrade, you can dash by pressing SPACE and moving sideways (i.e. ASD for right, DSA for left) and holding the last key down. Once you let go, you stop dashing. You cannot be hit by non-instant lasers while dashing. DASHING IS VERY USEFUL FOR THE LATER LEVELS. 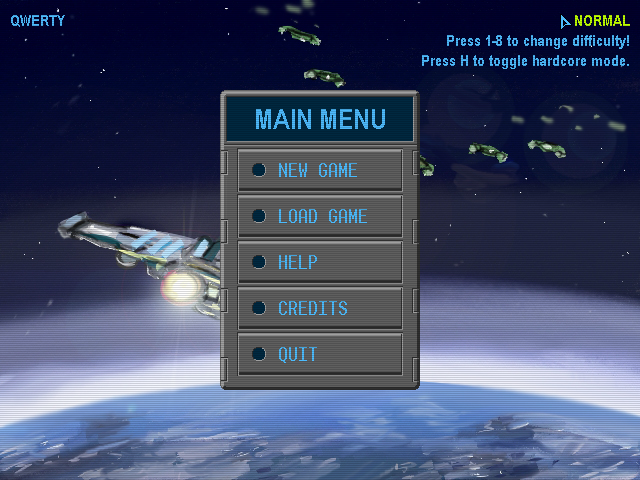 - You can pause the game with P, restart the level with R and exit to the menu with Esc. The latter two open a prompt before doing anything. - The "Badges" system is dysfunctional, but is due for an overhaul. At the moment though, there's only 19 levels done, including the two boss fights. Oh yeah it's made with Game Maker, and you can press F1 at any time to open a slightly outdated help screen. DO YOU LIKE WHAT WE'RE DOING? WOULD YOU LIKE TO THROW MONEY AT YOUR SCREEN? NO? OH WELL, HAVE A BUTTON ANYWAYS. Last edited by Shook on Wed Feb 12, 2014 9:59 pm, edited 4 times in total. The game crashed after I completed the first level. Something about it being unable to save. Looking pretty good so far. 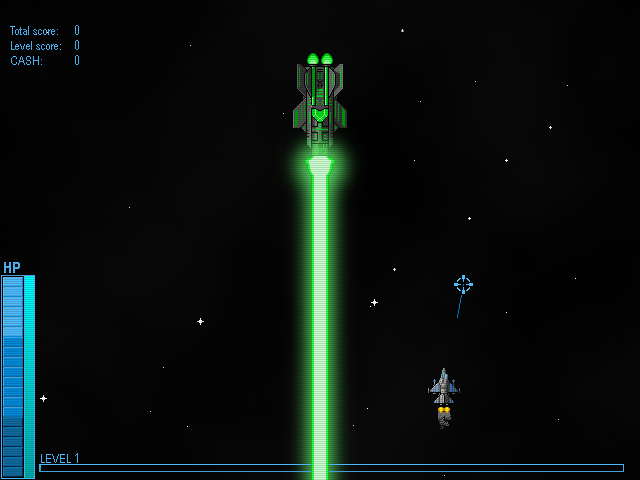 The glowy shooting effects are nice, the music is well-done, and the upgrade text is particularly excellent. I think my only complaint is that the waves have such a huge number of enemies that it makes your guns feel kind of weak. When you get to later levels, it's not too bad, but the first level does make them feel kind of underwhelming. That could be what you're going for, though, to make the progression feel more pew-pew... y once you've got bigger guns. So, yeah. Don't let me stop you if that's the case. Fair point, though at this point, i don't really know how to make it less underwhelming without screwing up the already dodgy balance (as it stands, speccing for offense > defense). As you mentioned though, it does make the weapon progression pretty apparent, especially once the early mook types just die like flies. I like to consider that the player starts out power hungry, then gets that power to play with in the first 9 levels, and then the aliens hit back in the levels 10 and forward. That isn't to say i'm not considering the first levels, though. Also, i should probably mention that the music isn't made by me, but i have gotten permission from all musicians involved. @Harzipan: I can confirm that the public version does work (just ran through all levels on Normal), though as mentioned, it might require running it as an admin, since it will try to create a savegame file. Hey, this is a good game. I really like the art work, it's pretty good and funny at times. Also, now that i'm here and remembering it, might as well hit you with the few news i have. POINT A: I've contacted an awesome musician and asked if he wanted to do some music, and he said yes! All at his own pace of course, but assuming that everything works out, you'll be hearing some rad tunes in the future. You should have it have a bunch of guns that fire slow bullets in a pattern that actually says "♥♥♥♥ You" as the pattern flies towards you. EDIT: I just found out about Difficulty. And that you shouldnt play on ANGRY BABY MODE >:C till lvl 15. To give you an idea of how much of a roflstomp baby mode is: With maxed defense, i had to actively try to die against the first boss for MINUTES before i died. On the other end of the scale, EPIC MAN MODE >:C has you dying every other second against that boss. Not just because you take 20 times as much damage (which is not a typo), but also because enemies fire 50% faster. It's a bit like a danmaku shooter, except your hitbox isn't tiny and you have no panic button (but there are also fewer boolits). also you are using both mouse buttons right? Also E and F for super shots, if you didn't know that already. Yeah, i know about the LMB and RMB Stuff. Turrent and Front Guns. And about the SUPER BOOLETS you shoot. I only got to the second boss, as i said, on normal. It was pretty hard though, and i didnt come forward. On the other way, ANGRY BABY MODE >:C is too easy for me, if you only buy all offensive stuffs. Might still have to tweak it a little (or maybe change those slow shots to something else), but not to the point of it becoming too easy. After all, the bosses are supposed to have roughly the same lethality by themselves as an entire standard level, but packed into a shorter time. That said though, this boss is practically impossible on the higher difficulties, since i'm pretty sure it's impossible to dodge all the shots. It IS possible with the first boss (i actually managed to complete it on EPIC MAN MODE >:C while recording it, though i did use devhax to get all the upgrades [and this was before the current skill system]), it's just tricky as ♥♥♥♥ because of the random timing of the hitscan beams (which i added specifically because it was too easy to just get into a rhythm and dodge everything).